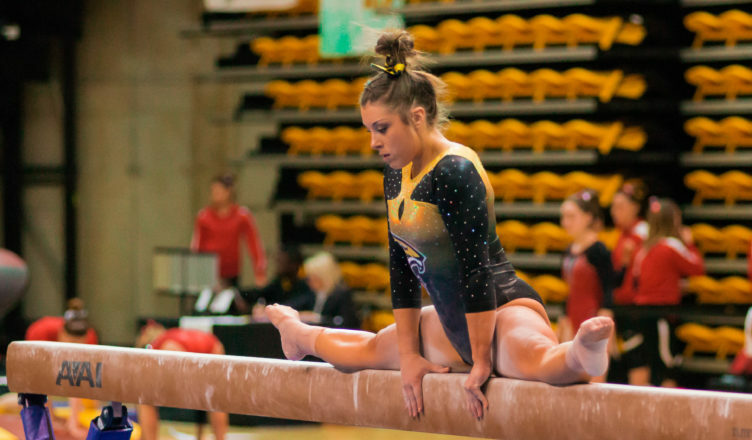 Sunday afternoon saw the Towson Tigers gymnastics team hold on for one of their strongest team performances to date in a 193.525-192.550 victory over West Chester University at SECU Arena. The squad got off to a flying start on the vault exercise with freshman Emerson Hurst and senior Cortni Baker leading the way sharing a score of 9.750. The Tigers continued their hot start in the uneven bars as several athletes excelled in their performance. Junior Ally Wesoly scored a 9.775 in her routine, which was followed by Baker’s 9.750 and West Chester sophomore Melanie Wojewoda scoring 9.675. Heading into its final exercise of the meet, Towson held a slim 144.925-144.650 lead over the Golden Rams. The Tigers knew that their upcoming floor exercise would pose a big hurdle for them individually, and as a team. However, the team was very much up to the task. Baker and Wesoly crushed their routines with a score of 9.800, but that wasn’t all for for the home team. Junior Melissa Temkov and Senior Mary-Elle Arduino contributed a 9.725 score while sophomore Tess Zientek helped push the team closer to victory with a 9.550 score. Wesoly finished off the afternoon receiving a first place all-around score of 38.925. Next, the Tigers will head south to Chapel Hill for a matchup against North Carolina on Saturday, Feb. 9 at 4 p.m. at Carmichael Arena.